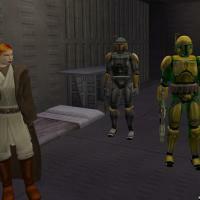 I've never liked the KotOR Mandalorians. I wished them to look like Jango and Boba Fett. I mean, I wished them to have Fett-style armors and helmets. So, I've tried to make such mod. It is not perfect, but I hope you'll like it. 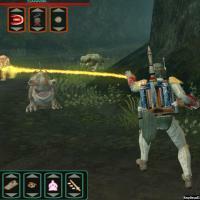 It will change the appearance of all Mandalorians in the game, including Mandalore (he transformed into Jango). 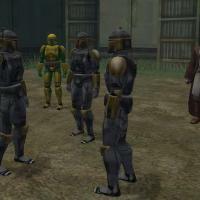 - Changed appearance of ALL Mandalorians in game. Now they use completely new armors and helmets, which are made in style of Jango and Boba Fett. - Mandalore transformed into Jango Fett. Available two versions of his armor - with jetpack and without it. You may use any, because now you can unequip his armor (and see Canderous). - Kelborn now have unique armor. 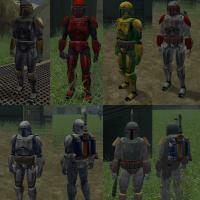 - New Mandalorian armors for your PC and party members. At this point, they are available for male characters only. - Mandalore comes equipped with 2 Westar Blaster pistols and special Mandalorian flamethrower. For those of you who like Boba I also provided EE-3 Blaster rifle. All this items are quite powerfull, but IMO that will not break game's balance ('cause ranged weapons are NOT effective in TSL). 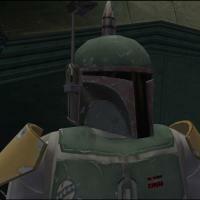 - NeoMarz1 - for creating awesome Mandalorian model for Jedi Academy. I've used this model in this version of MOD. - Don Kain - I've used some texture parts (symbol on Kelborn's armor) from his JA mandalorian skinpack. - Orsan - I used&altered 2 textures he made for KotOR1 (Boba and Jango armors on the upgrade screen). - Lit Ridl - for allowing me to modify his flamethrower script. Under NO CIRCUMSTANCES ANY OF MY MODS TO BE UPLOADED TO STEAM WORKSHOP. Anything else - be my guest, use like you want, just give credit to me. - Fixed bug in one of the armors which caused game to crash. - Remodeled EE-3 Blaster rifle. - Remodeled Boba's helmet and reskinned his armor. - Changed properties of some armors.